After finishing their incarceration felons often apply for jobs in areas they have worked in before. Others attempt to find something in a different field, requiring more education or learning new skills. Either way, there are resources available for them to find employment. Some may want to look into a starting business of their own. 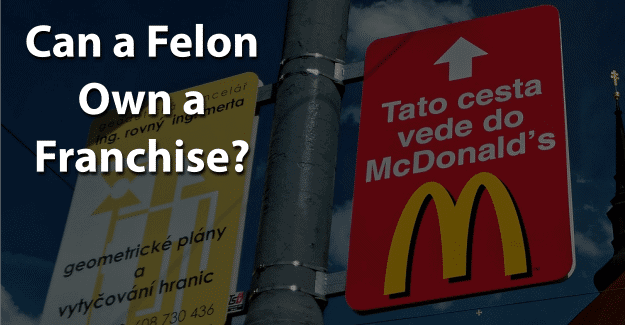 This blog post will address the issue of whether or not a felon can own a franchise. A franchise involves a licensed agreement with a company for someone to own and operate independently under the franchising company’s rules. The franchise agreement will require the licensed franchise agent to make certain profit payments to the franchising company. When selecting a franchise it’s important to know what opportunities are available. Selecting the correct franchise depends on a person’s budget, qualifications, and personal interest. Credit score. While the minimum credit score varies according to the company, generally a score of 680 or above is required. Net worth. If a franchise requires a large initial investment, a person’s net worth will have to qualify at a certain level. Cash on hand. An applicant needs to have enough cash on hand to cover the franchise costs or a down payment if the franchise costs are financed. Outside income. An applicant should have another form of income and financial resources to live on while starting the franchise. Industry experience. While some franchises do not require business or industry experience, this will increase the likelihood of being approved. Management experience. Having management experience is important because as a licensed franchise holder, an applicant will manage a team of employees. Total investment required. This will include franchise fees, training expenses, and equipment. Ongoing costs. This will include fees, marketing, and advertising in addition to operating expenses. Training and support. Find out what training and support are provided by the franchising company and how much this training will cost. Competition. Know what other franchises are in the vicinity and what other existing businesses may be in competition. There is no Federal or state law preventing a felon from owning a business, including a franchise. A felon may be prohibited from owning some franchises based on the type of business and the requirements for licensing. Licensing and bonding for a franchise can be affected by a felony. A felon may not be able to obtain a surety bond, which is a type of insurance policy to protect customers. A surety bond is typically required for a plumber, contractor, mortgage provider, and auto dealer in many states. It is essential for a felon to talk with an attorney for advice on how to proceed with owning a franchise. Companies that license franchises evaluate persons based mainly on their credit standing. These companies require business knowledge, startup experience, and qualities of the applicant to make him or her successful. These include credit and financial checks. When looking at their credit rating, many felons have faced financial losses resulting in lowered credit standing. When seeking a franchise, it may be difficult to be approved as a result and lead to problems getting financing. A criminal background check is likely if the company runs background checks on the employees they hire. It’s important to be honest about their conviction because to have an offense show up later would bring up questions about integrity and character. Some companies will conduct criminal background checks and use these results to approve an application. Other companies will follow the government guidelines on employment discrimination against those with a criminal background. With competition for a franchise, the company could use a criminal background check as one of its deciding factors. When the company inquires about someone’s criminal background, and he or she is not honest in disclosing it, this raises serious questions about the applicant’s character and honesty. Federal and equal employment opportunity regulations prevent discrimination according to someone’s criminal history. This does not keep the company from using criminal history as part of its decision-making, however. And while there aren’t laws regarding franchises, businesses typically follow Federal hiring standards, even when considering franchise applications. So, it’s crucial to be honest when applying for a franchise license. If a felony isn’t disclosed but is found on a background check, this constitutes fraud and is punishable. It is a crime to falsify an application which could result in being sent back to prison. Having their record expunged can give them the chance needed to begin with a clean record and succeed in obtaining a franchise license. Expunging a criminal record allows anyone to honestly state on a franchise application that he or she has not been convicted of a crime. It’s a challenge, but it might be worth it for a felon that wants to own a franchise. Having his or her record expunged and also documenting any training programs or additional education could make the essential difference in a felon succeeding in opening a franchise. What do you think about this blog post? Have you or someone you know been in the situation of trying to own a franchise with a felony? What was that like for him or her, and how did he or she achieve success? Please tell us in the comments below.